Part of the reason we use wine corks to seal to bottles today is simply from tradition. Cork or other sealants in some form have been used to seal vessels holding wine for thousands of years. Prior to the development of corks for bottle sealants, cloth or leather was the primary choice, later followed by clay and sealing wax. It is reported that cork might have been used by the Greeks and Romans, although it was not the closure of choice. Glass was used a sealer by the 1500’s. As you can imagine, glass was expensive and difficult to manufacture as the bottles were hand blown at the time, each glass stopper was also created on an individual basis. Cork started to become the sealing material of choice in the late 1600’s when it became possible to create glass wine bottles with an almost uniform shape and design. It took until the late 1700’s to create easy to use corkscrews for the wine lover or tavern owner. At that point in history, cork replaced glass wine stoppers, which while they worked well, glass stoppers were not easy to remove without breaking the wine bottle. The pairing of the cork and wine bottle ushered fine wine into the modern age, as from that point forward, wine had the ability to age and evolve in the bottle. Interestingly cork and fine wine share another commonality. The cork, oak tree needs to be at least 25 years old before the material used to create the cork can be harvested. This is similar to the age of vines in many of the world’s best wine regions. Wine corks became popular slightly after glass bottles began gaining in popularity as they were a lot less expensive to manufacture and easier to remove from the bottle than glass. In time, by the 17th century, wine corks became the sealer of choice because it was quickly discovered that corks could seal the wine in the bottle, severely retards the oxidation process, allowing the wine to age and evolve slowly over time. This takes place because corks, or better put, quality corks allow a minimal amount of oxygen into the wine. This is important because when air interacts with wine, it causes the wine to eventually oxidize. As we mentioned, a minimal amount of air needs to interact with the wine because that is how wines develop their mature, secondary qualities as well as expel unwanted aromas. The best corks allow close to 1 milligram of oxygen to enter the bottle each year. This is just the right amount of air to remove the sulfites that were added in the bottling process to keep the wine fresh and to avoid the harmful effects of oxidation. This small amount of air is perfect for helping age-worthy wines develop their complexities while the tannins are busy softening. Cork is produced from the sponge like material taken from cork oak trees, also known as Quercus Suber. Cork oak trees are grown primarily in Portugal. Cork oak trees are also planted in Spain. The trees are quite tall, reaching up to 60 feet high, and 12 feet in circumference when fully grown. Cork continues to regrow after the bark has been harvested. However it needs time, so the cork bark is only harvested once, every 9 years or so. To make sure the same tree is not harvested too often, after the fork material has been removed from the tree, each trunk is marked in white, letting the farmers know when they can pull off more material from the tree. After harvest, the cork material needs time to dry, so the bark is placed on clean surfaces, until dried. The drying out takes between one month to 6 months, depending on the moisture and density of the cork material. Once the cork bark is sufficiently dried, the cork goes through several processes, starting with a boiling of the cork, which takes place in large, stainless tanks. Boiling cleans and sterilizes the cork, as well as softens it, allowing the cork to eventually be reshaped, into the bottle enclosures we know today. From there, the best quality corks are punched out of the cork bark. Lesser quality corks are manufactured from pressed shreds of cork bark. After being cut, the corks are once again washed, cleaned, sterilized and dried. Some corks are lightly coated in wax at this point. From there, the corks are sorted by quality, bagged and shipped to bottlers and wineries. Alternative closures to cork are being tested in many different wine producing countries. Perhaps Australia has embraced screw-caps more than any other country. The practice of using aluminum screwcaps to seal wine bottles began in Australia and New Zealand in the 1970’s. Although some producers in California and the Rhone Valley have tried using them as well. In Bordeaux, Chateau Margaux has been experimenting with screw-caps for Pavillon Rouge since 2002. Screwcaps consist of a metal cap with a liner inside the top of the cap that attaches to the bottle lip for its seal. Equally important in the screwcap is the inside liner which controls the inability of air to enter into the bottle. Because cork is porous and allows a minor exchange of oxygen, wines are in theory able to age, evolve and improve with extended bottle age. It is not yet known how wine will age when sealed with screwcaps. Today, manufactures of screw-caps have improved their product so that they are now constructed to allow for limited amounts of air into the bottle. However, screwcaps have other problems as well. Studies have shown that not all screwcaps enclosures are applied correctly. The lack of a perfect seal causes the wine to experience premature oxidation. The ability for wines meant to age in the bottle is paramount to collectors and producers. The lack of evidence as to how wines with screwcaps will age, is a major concern. Advances in technology have led to the creation of VinPerfect. VinPerfect allows for the introduction of oxygen into the bottle, which will help the wine develop along a more natural path. The company is trying to develop a series of enclosures that allow the precise amount of oxygen tailored to the specific wines development. Synthetic corks created from plastic have made vast improvements since they were first introduced. The initial synthetic corks were often deep purple and while they were produced to try resembling wine stained corks, they actually looked like more like rubber. Today, that is not the case as they are created to look exactly like natural corks. The problems with synthetic corks is the lack of a perfect seal. In turn that allows more unwanted air into the bottle, causing the wine to oxidize. Worse, many of the synthetic corks have been known to impart a slight rubber or chemical smell, damaging the wine. Behrens and Hitchcock, a producer of Cabernet Sauvignon in Napa California was one of the early proponents of plastic corks. Most of the wines bottled using those synthetic corks have not developed well. Many of those wines are defective. However, today, they have improved since their initial creation. Because the plastic corks allow air to integrate at a faster pace than normal corks, some winemakers actually prefer it. In fact, that has become part of the selling point as the corks can be ordered to allow for a more or less rapid transmission of air into the wine, based on the tightness of seal. Some producers, mostly in Europe have embraced glass/plastic closures from Vino Seal. The Vino Seal is a glass stopper that creates a perfect seal. A perfect seal is not what you need for wines that require bottle age to develop. Problems due to the lack of oxygen. exchange, which does not allow for long time aging of the wine, coupled with the high cost has not helped the glass, wine bottle sealer gain wide acceptance. Wine corks do however have problems, the major issue being infection with TCA, which causes what is known by wine collectors and others in the wine business as Corked Wine. Corked bottles of wine remains a serious problem in the wine industry as many people think that it effects between 5% to 10% of all wine undrinkable. Some producers that prefer cork, and want to further reduce their risk to TCA infected bottles have been using DIAM. DIAM is made from natural cork, but instead of using large sheets of cork bark to make the cork, the cork is produced from small pieces of cork particles that have been glued together to form a cork. Perhaps the biggest boost for DIAM took place starting with the bottling of the 2014 Burgundy vintage when Domaine Leflaive announced they were bottling their entire white Burgundy lineup using DIAM corks, in an effort to eradicate pre-mox, or premature oxidation issues. This was seen as fairly big news, because the traditional, Burgundy wine region is slow to change their ways, or even consider admitting their is a problem. Only Domaine Ponsot tried finding a solution when they switched to using plastic corks from ArdeaSeal. The old saying that nothing lasts forever is especially true with wine. When a wine cork degrades, so does the wine, due to additional exposure to air, which in turn causes premature oxidization. 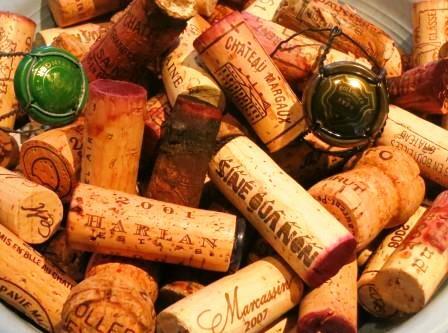 Before that happens, for rare and expensive bottles, it might be possible to replace your old cork with a new wine cork. This is something you cannot do at home on your own. For more on replacing your wine cork, Everything you need to know about Re-Corking wine bottles. Corks have been the undisputed choice to seal wine bottles for hundreds of years. But with all the alternative enclosures available these days, by 2016, it is estimated that only 70% of all wine bottles today are sealed with natural corks. Still, at the end of day, it is unlikely corks will be replaced as the sealer of choice for the best wines. In part, there is the romance and tradition of removing the cork, coupled with that special popping sound that lets you know, you are about to drink a wine and that is something technology cannot improve on.